ChoiceOne has been an approved Group Training Organisation (GTO) in Perth for over 10 years. Throughout that time, over 200 candidates have been successfully placed with numerous clients. One the largest contributing factors to the success of the apprentice and training program, is our hands-on management of the apprentices and the low risk for the clients involved. As a GTO, we take on all the employer and training obligations, so clients can get on with running their business. 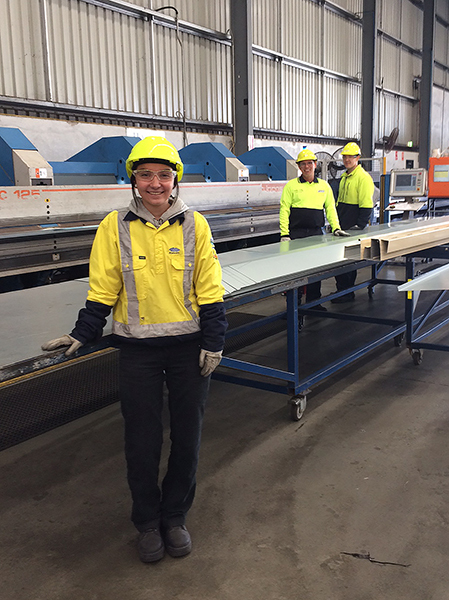 BlueScope Steel saw the program as a great opportunity, and so did Chloe Fraser. BlueScope has been a landmark Australian company, pioneering in the steel industry since 1915. A large part of their sustained success is diversity. As a company, they have a real understanding that their success comes from people–people who reflect the diversity of their customers, markets and the communities in which they operate. With diversity as a driving focus, BlueScope happily took on their first female apprentice, extending their own hiring practice to an exciting new level. Chloe Fraser joins the ChoiceOne apprentice program as a sheet metal fabricator, and we couldn’t be more pleased with the result! At a young age, Chloe was already challenging the gender roles with her interest in mechanics, getting into the grit while working on cars with her father. But it’s the fruitful future that the apprentice program offers that really assisted her continued interest of working with her hands. “I didn’t want gender roles to get in the way of my dreams, and BlueScope has given me that opportunity to be an apprentice sheet metal fabricator, guiding me into a bright future.” says Chloe about her experience. Chloe is working at BlueScope as an Engineering Tradesperson Fabrication (light) apprentice, complemented with study at TAFE. This 48 month apprenticeship will put Chloe in a favourable position in her career, proving that committed program support and hard work might just be the secret formula to continued workforce success! Both BlueScope and Chloe have positive reviews of their experience, with the mutual goal of continued employment, following the apprenticeship. Win win! Chloe even has aspirations of running her own business within the metal fabrication industry. Further to that, BlueScope is so pleased with the program they have hired ChoiceOne to manage their own internal apprenticeship program. A true testament to the exceptional value and quality of service this program provides. Although this story is particularly inspiring, the apprenticeship program has a long and celebrated track record. For example, Chris Capao is another apprentice that shined as a ChoiceOne apprentice. You can read his story here! Are you interesting in taking on an Apprentice or Trainee to support your business operations? Our GTO team is eager to provide more information on our Group Training. Contact us today at +61 8 9215 3888 or visit our GTO page for further info.